This blog post deals with the strange and wonderful things that sometimes appear in unexpected places. It’s something that happens often, making the job all the more rewarding for it. While having a tidy up in the map storage area we found an old rectangular box. Inside were 3 rolled maps; one from just after World War I by the Geographical Section of the War Office, the other two from 1857 published by the wonderfully named ‘National Society for promoting the education of the poor in the principals of the established Church’. Underneath these three objects was this single sheet of paper. 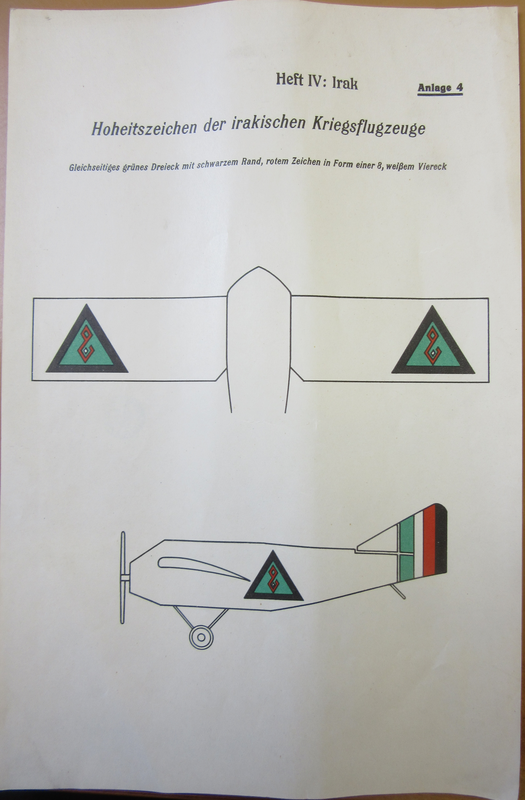 The translation of the main text is ‘Insignia of Iraqi warplanes, equilateral green triangle with black border, red sign in the form of an 8, white square’. 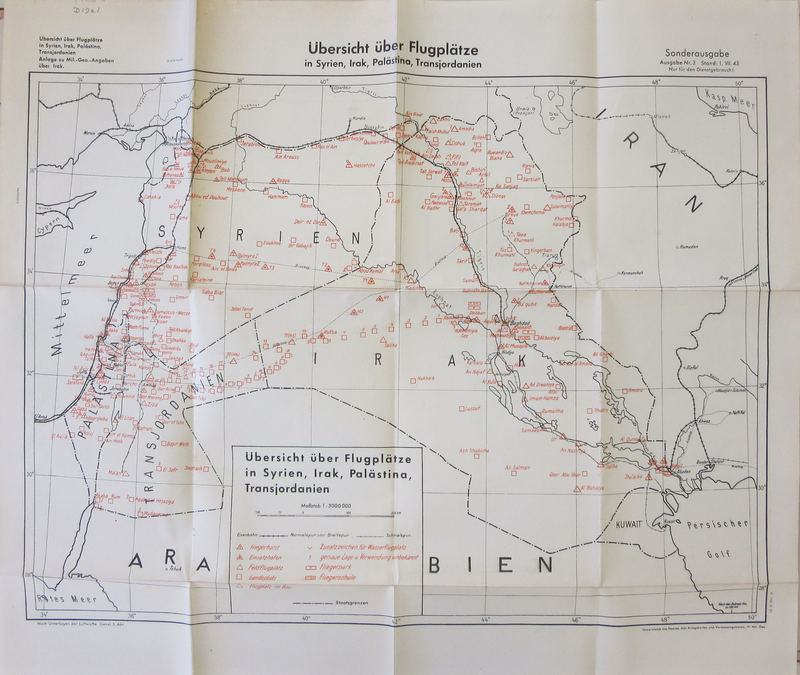 The page comes from a booklet made by the German Army, presumably about Iraq though it could equally be about Syria or the Middle East. Iraqi involvement in the Second World War was brief. The Golden Square, a group of army officers, staged a coup in 1941, deposing the ruling family. British concerns that oil supplies would be diverted to the Axis powers lead to a brief, and for the British successful, war in May 1941. It is hard to identify where this sheet has come from. 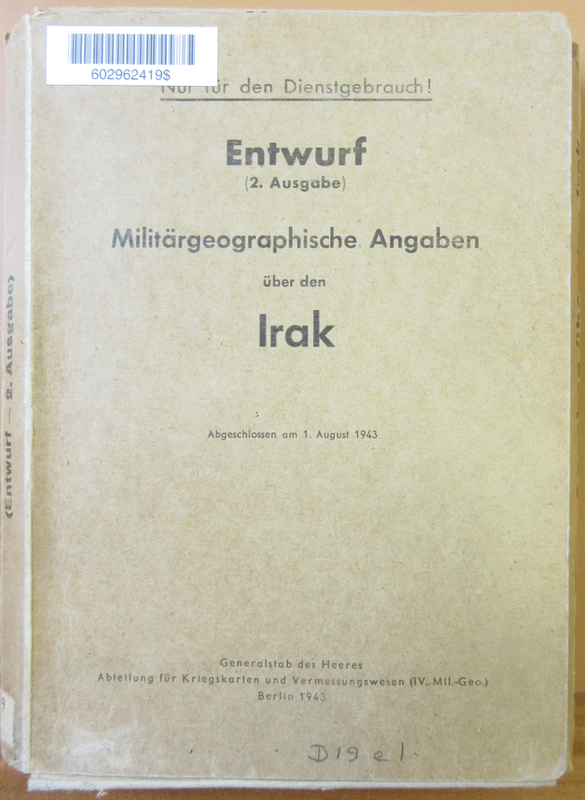 Throughout the war General Staff of the Germany Army prepared pamphlet packages on a large number of countries, including all European countries, most of the African countries north of the equator and those in the Middle East, but this sheet hasn’t come from one of these. The pamphlets included maps, information booklets and books of photographs. The books were usually compiled by academics familiar with the country in question and there are pamphlets produced for neutral countries as well as allies such as Italy and Romania. The earliest pamphlets date from 1939 and were produced in strong red cases, by 1943 shortages of materials meant that weaker card cases were used. Considering the single sheet deals with airplanes it’s appropriate that one of the maps in the Irak collection deals with airfields. This entry was posted in Uncategorized on 10 April 2019 by stuart.